If one picture could sum up the transformation of the First fleet in Plymouth these days its this one. Over twenty years old and towards the end of its life, but looking immaculate. It has even been fitted with the new destination equipment which has been rolled out across the fleet. If the VR fleet had been treated this good in the last few years they could still be going strong! This is one of the Torpoint fleet. 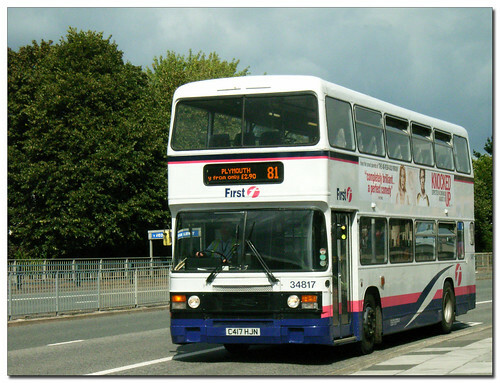 For another great set of Torpoint buses over the years try Terry's blog. Your dead right there. I would haev loved the VRs to still be going. But the Olympians at Torpoint were all done up when they transfered down here from Bristol and Essex. In order of best at Torpoint as I use them every day 34817, 34813, 34812, 34809. As 34809 hasn't been as reliable and 34812 has also broken down before. And 30065 was a very good Olympian now transfered down to Penzance.